Chunky roach dominated two river matches 15 miles apart as Sunday turned out to be a real red-fin letter day for some lucky rods. One was Kevin Osborne, netting more than 20lb – roach with a few dace thrown in – to win an impromptu sweep on the Ouzel/Lovat in Newport, only a short distance from where it joins the Ouse. Tucked up against the town's two-hundred-plus years-old wrought-iron Tickford bridge, he was able to 'fish proper' – trotting maggot under a stickfloat on running line to total 20-6, while feeding some three-and-a-half pints of bait during the match. At the other end of the match-length Bob Gale, pegged on Cemetery Corner, found worm the going bait as he put together 18-14 of perch for second, followed by Paul Chapman with 6-6 of bits. AND while the Ouzel roach were queuing up for Kevin, Mick Goodridge was enjoying a similar experience on the even-smaller Tove – another Ouse tributary – in Towcester's match on their town length. Fishing a totally unfancied swim he found bites hard to hit on the whip, switched to the pole and never looked back as he netted a hundred or so fish – roach to 10 ounces and dace to six – to win with 17-12. John Broughton had 10-7 and Dave Gibbins 5-4. THE embryonic Ouse at Buckingham didn't fish too bad for Calvert, either, as Ben Holloway won with 12-9 – well clear of Austin Maddock 8-3 and Tony Richardson 7-14. 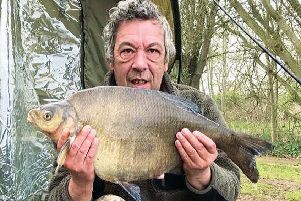 ON the cut near Peartree Gary Maton brightened up his 'blue Monday' with a perch and an unseasonal tench – both around 2-8 – a jack, and a small shoal of silvers. ALDERS open: Mick Denton 103lb, Roy Makins 97lb, Kevin Elliot 72lb. MK Vets, Stony Ouse: Dave Ridgeway and Barry Witteridge both 2-8, Martin Cunniffe 2-7, Kevin Osborne 2lb.